Strengthen students' ability to learn across the curriculum by teaching critical cognitive skills embedded in the Common Core State Standards. 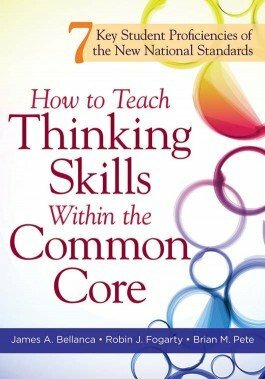 Packed with examples and tools, this practical guide prepares teachers across all grade levels and content areas to teach the most critical cognitive skills from the Common Core State Standards. Discover a doable three-phase model of explicit teaching, guided practice in content-based lessons, and authentic application in standards-based performance tasks that will strengthen students' ability to learn across the curriculum. Discover the desired student proficiencies of the CCSS: critical thinking, creative thinking, complex thinking, comprehensive thinking, collaborative thinking, communicative thinking, and cognitive transfer. Explore phase I, Talk-Through, during which teachers explicitly teach students a critical thinking skill. Utilize the content-based lessons included in phase II, Walk-Through, when specific guidance will ensure proper application of the skill. Learn how to make a direct connection between the selected thinking skill and the new standards with the CCSS performance tasks modeled in phase III. Take advantage of online and print resources, a glossary, reproducibles, reflection questions, and more.